This is the most common form of colic I see in horses. It can usually be resolved if treated early but can become life threatening if poorly managed. To understand why horses are so prone to impaction colic one only needs to look at the anatomy of their digestive tract. The large colon of the horse measures 10 to 13 feet long with an average volume of 21 gallons. It lays in the abdomen in the shape of a double U by running forward from the right side ( right ventral colon ), bending double at the diaphragm and continuing back on the left side ( left ventral colon ). At the pelvis it makes another U turn and goes forward again (left dorsal colon ) then bends again at the diaphragm to go down the right side ( right dorsal colon ). As if all of this bending around wasn’t enough at the pelvic flexure the left dorsal colon becomes much narrower. It is no surprise that this area is the most common site of impactions. The small colon, also called the descending colon, reaches a length of up to 4 meters and is located mostly on the left side of the abdomen. It is narrow and another common site of impaction. Horses with uncomplicated impaction colic are usually not in severe pain. They may refuse food and water, look around at their sides, paw the ground, and lay down. They may have intermittent cramping but are rarely in sustained, severe discomfort. Mild dehydration may show up as dry gums and skin that is less flexible. Impactions usually develop over several hours or days so it is important to check the stall for manure. If there has been no manure in over 12 hours it may indicate a more advanced case. This is important because some horse have a high pain tolerance and won’t exhibit discomfort until the impaction is well established. Also, horses with this kind of colic may cut back on their water consumption. This should be an early warning sign even if the horse appears fine otherwise. Even if symptoms are mild it is still a good idea to notify your veterinarian. Most impactions do not require immediate attention but if your horse does not respond to your first aid it is good to get on your vet’s schedule. After noting vital signs such as pulse, temperature, respiration, gum color, gut motility, and degree of pain take your horse out for a short 5 -10 minute walk. Sometimes this is all it takes for a stalled horse to get a mild impaction moving. 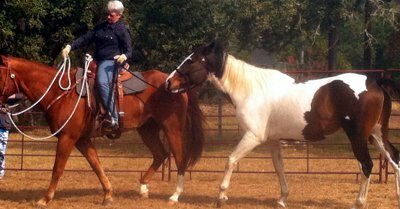 TTeam™ body work, ear work and belly lifts may help relax your horse. The homeopathic remedy nux vomica will often help increase intestinal motility. I use a 6c potency given once every 10 minutes for up to 4 doses. If your horse seems to be having some cramping you can alternate nux vomica and chamomile 30c. You can also give a probiotic paste which will increase motility by replenishing beneficial bacteria in the gut. If these measures do not bring relief to your horse within 1 hour it is a good idea to proceed to conventional veterinary treatment. Mineral oil and oral electrolytes are my first line treatments for impaction colic. After physical exam a stomach tube is passed to remove any gas from the stomach and administer the medications. One-half to one gallon of mineral oil will lubricate the impaction, and one-half to one gallon of oral electrolytes will correct mild dehydration. If pain is not relieved by removing gas off the stomach then an anti-inflammatory agent such as Banamine™ of Ketophin™ can be given. Removing the gas off the stomach is critical before giving any pain reliever. Most horses cannot burp so covering up pain from a distended stomach could lead to serious consequences. Once a horse has received a pain killer he should be observed for at least 5 hours to make sure the drug is out of his system and he is still pain free. Grain and hay should be withheld until oil is passing in the manure. This usually takes 12 -24 hours. Bran mashes and grass can be offered, in moderation, if your horse is hungry. If your horse is not drinking consider adding 1 tsp of Lite™ salt to the bran mash. Nux vomica 30c can be given twice a day to encourage your horse to drink following impaction colic. Acupuncture can also be valuable for a stubborn case. I use acupuncture when the horse does not respond within a few hours to conventional treatment. If gut motility does not return your horse may still be dehydrated. If oral fluids are not enough intravenous fluids may be required. Do not hesitate to go this route if your veterinarian recommends it. Exercise and good dental care are the best preventions for impaction colic. Also fresh clean water available at all times. My rule is if your horse doesn’t drink he doesn’t get to eat. In other words if you see a decrease in water consumption immediately increase the exercise and decrease the food. Give probiotics and a bran mash to avoid problems. The same rule holds if you see a decline in the amount of manure being passed. A good deworming schedule is also important. Some horses prone to impaction colic will do better on alfalfa or a grass/alfalfa mix hay.